Not too long ago I made an order from Cult Nails during a sale that Maria had. I ordered two colours and her top/base coat combo. 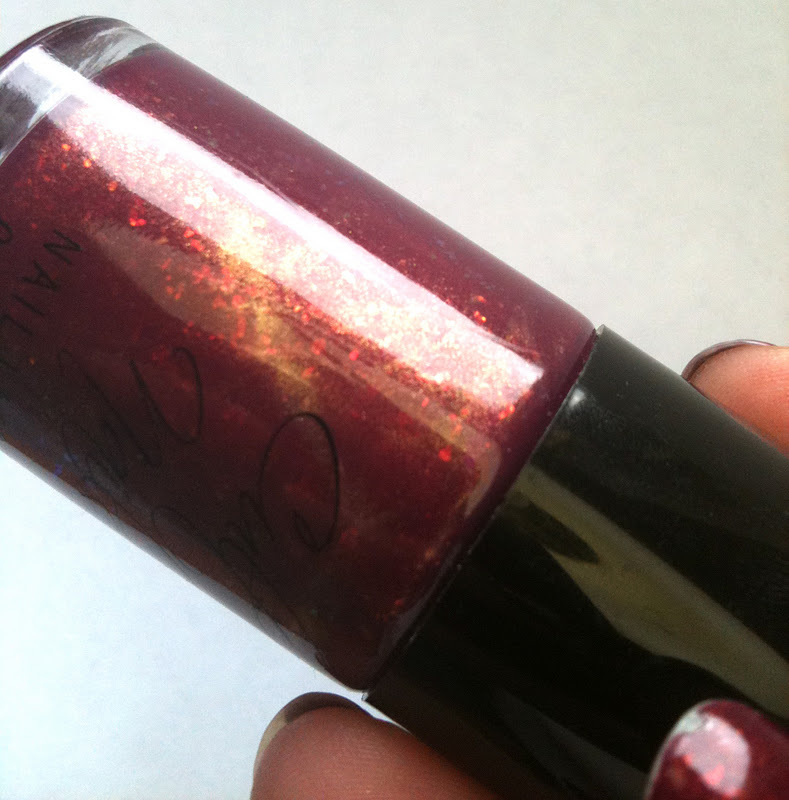 However, this review is only on Iconic, a beautiful deep berry/burgundy with gold shimmer and gold flakies. 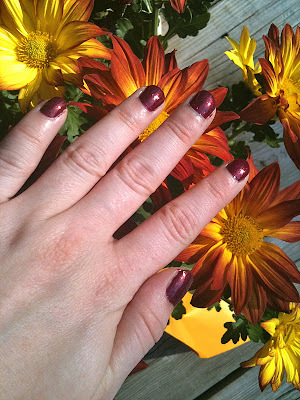 (The other polishes reviews are coming). Cult Nails for any of you that don't know, is a polish brand that was started by a fellow blogger, Maria from her love of polish. On her blog R3Daily (which I follow and love) you can really see the passion, creativity, hard work and care that she puts into each and every one of her polish colours. All her polishes are cruelty-free and lack the big 3 and Camphor which is great! This also means they don't smell nearly as bad as normal polishes. This colour Iconic is part of her main line and as soon as I saw it I fell in love. Normally, I'm not too traditional in my nail colour choices- I tend to avoid pinks and reds, but this colour is anything but traditional! Depending on the lighting this colour is rich royal red, deep burgundy, or a unique pinked berry shade. Not to mention the amazing gold shimmer and gold flakies throughout. Most of you probably don't know this, but I adore flakies. I just love how each nail is a little different and the effect they give is just fantastic. See! Do you see the awesome?! I wore this for Thanksgiving this year (Canadian Thanksgiving is in early October), and my entire family loved it. And yes I did show it off and ask them all including my mother, grandparents and my great uncle. The poor souls have to put up with the cosmetic addiction. The formula on this was fantastic too. 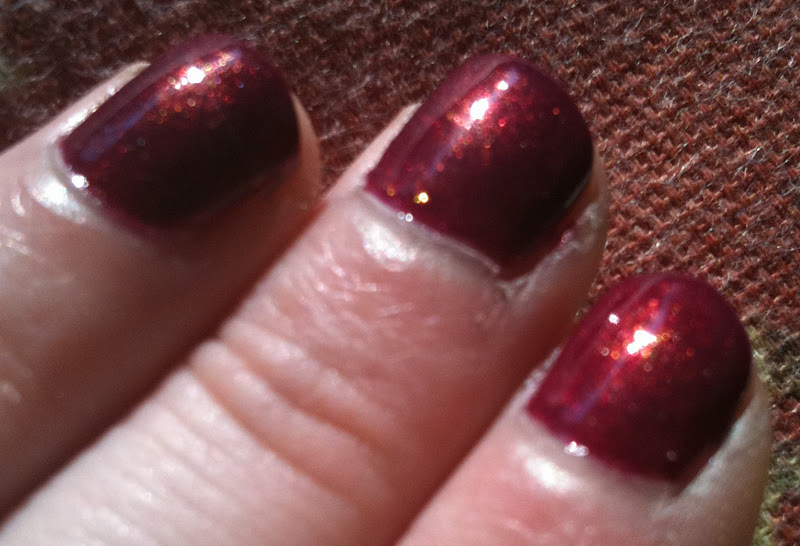 I can't tell you exactly how long it wore for (because I'm testing the Cult Nails top/base coat at the moment and telling you would negate the results for that review, which I want to try some other polishes with the top/base combo first) HOWEVER, it applied like a dream, especially for a flakie polish. For any of you that have used polishes with flakies or large glitter pieces before, I'm sure you know what I mean when I say sometimes there is dragging issues or clumping, but I didn't experience any of that with this polish at all. I had a little difficulty at the tip of one nail but a quick sort of re-swipe over the area fixed it up no problem, so that is more of a flakie handling issue than a fault of the polish. All the photos above are with only two coats. 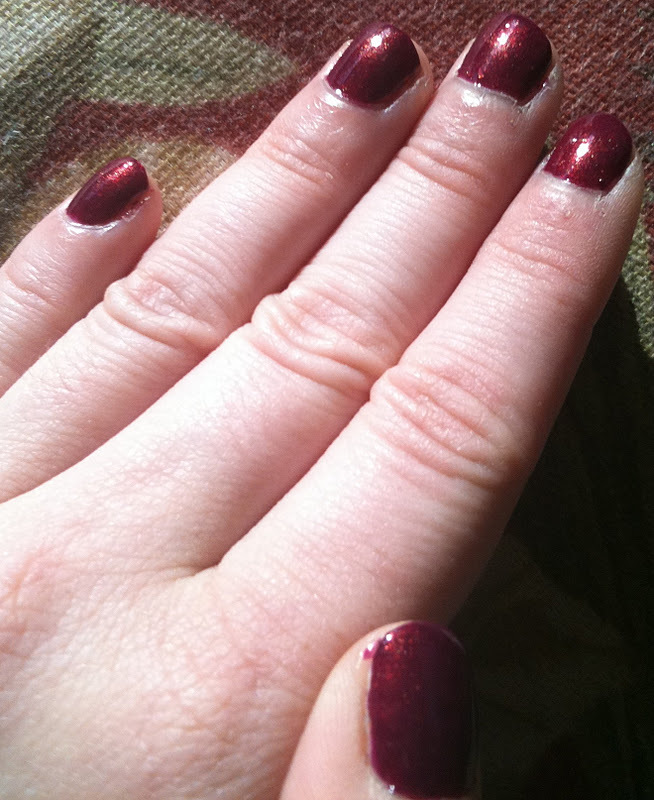 At first I was worried as it looked magenta on the first coat but a second coat turned it into a beautiful rich berry. Cult Nails polishes are $10 USD, which is fantastic because the quality (including the packaging which is easy to use, and has excellent brushes) is better than more expensive brands by far. Shipping isn't too bad either, especially because Maria often has sales and deals up. My polishes came to me individually wrapped in rough fabric-paper (which my gerbils adored being able to chew up into nesting material) and surrounded by cotton balls- which makes the polishes safe and provides you with nail polish removal. Not to mention eco-friendly! 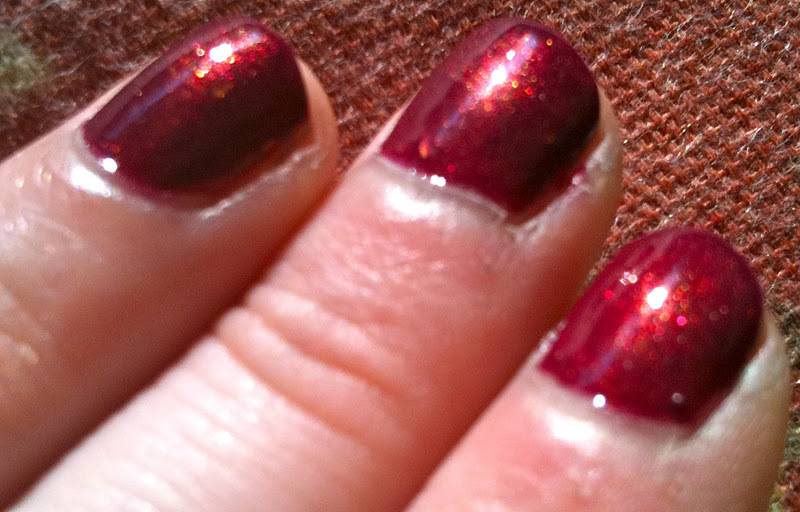 Overall, I think this polish is fantastic. It's perfect for fall as it's a rich hue and it goes with just about anything. It makes me feel all sophisticated and chic when I wear it. Sprite Rating: 10/10. This is going to be one of my staples I'm sure of it, especially for pedicures and in the fall. 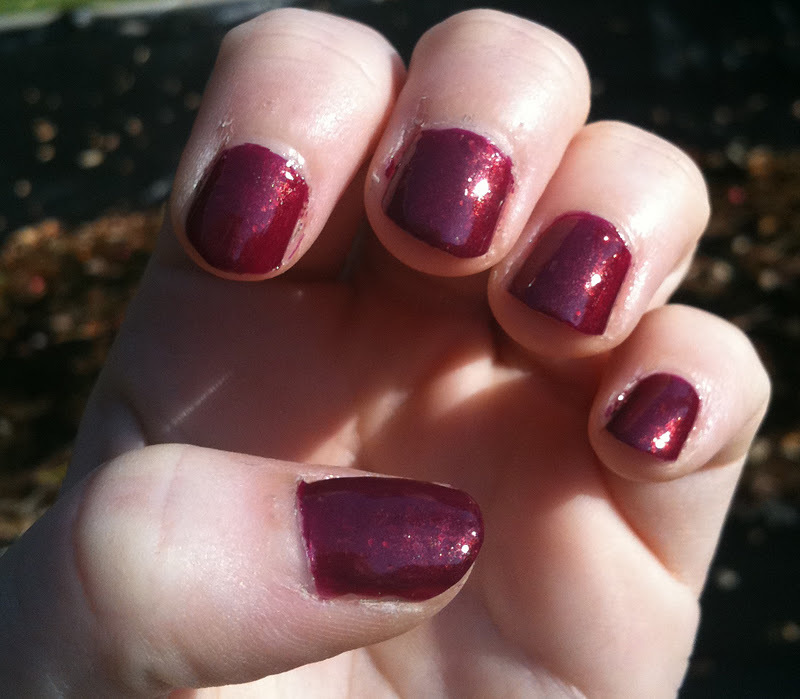 There is nothing bad about the polish, everything about it blew me away from formula to packaging to design. Maybe if they can get a consistent sticker on the bottom of the polishes (they have different fonts/layouts) but that's not an issue really as I rarely look at the bottom of my polish bottles anyways. Would I buy it again? Yes. Absolutely 100%. Needless to say I'm excited to try my other colour Living Water and you all will be reading more Cult Nails on here in the future!